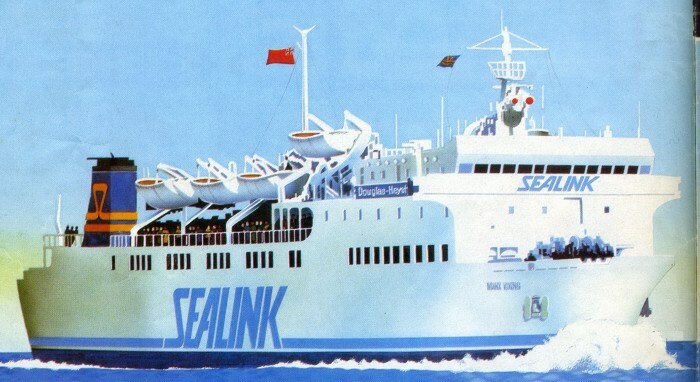 Above: Although the Manx Viking never received the new Sealink colours (introduced after 1984), she appeared in Sealink artists impressions for the 1985 season wearing them. 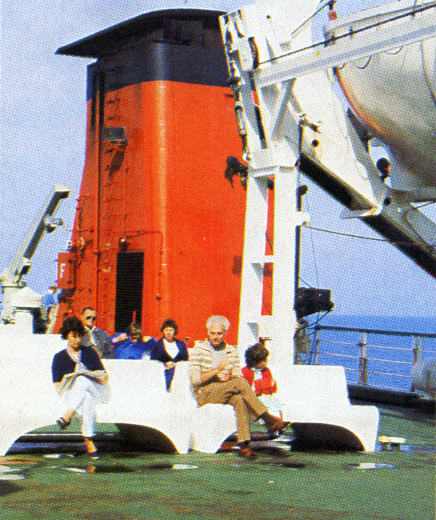 The ship was actually in dry dock in early 1985 having the new livery painted when she was pulled quickly back into service - the painting had not extended beyond the blue boot-topping and she ran with this combined with the old monastral blue hull for the remainder of the season. Top: The Manx Viking arrives at Douglas in her original Manx Line livery. 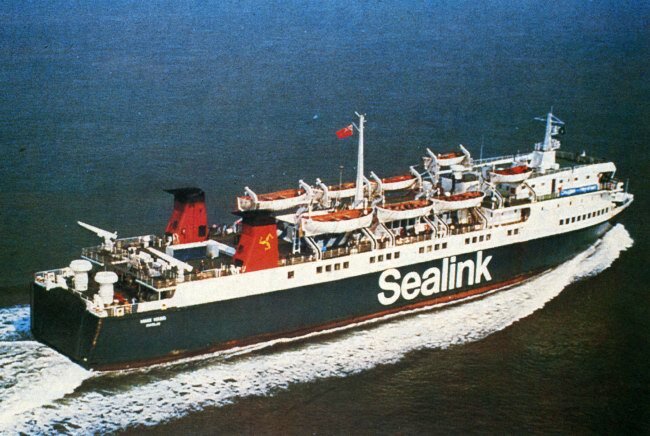 Below: The ship in her later Sealink colours. 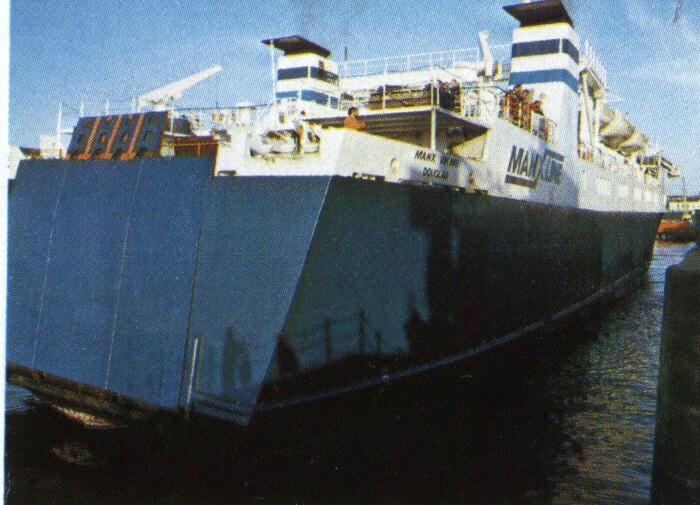 The Manx Viking was built in Spain in 1976 as the Monte Castillo of the "Aznar" Line. She ran a summer service in the Mediterranean, and in the winter carried fruit and vegetables across the notorious Bay of Biscay to Liverpool and Newhaven from Spain and the Balearic islands. 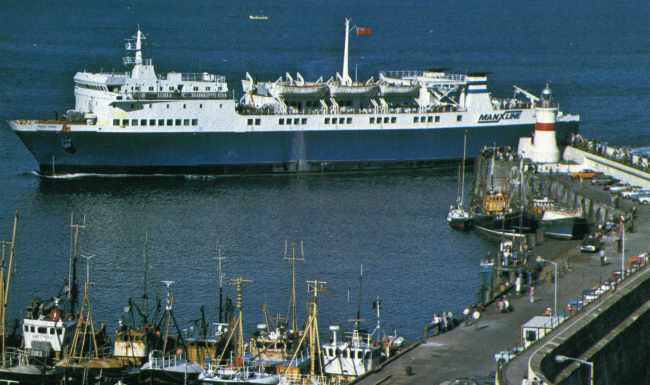 She was purchased by Manx Line, a new and independent Manx company, in 1978 and has been operated by Sealink since 1980. 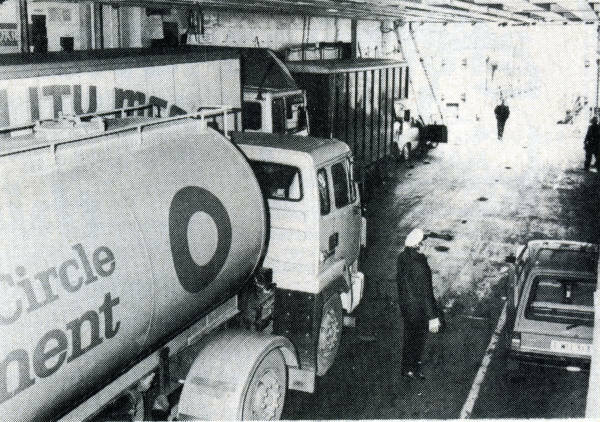 When Manx Line took over, the entire cargo area of the vessel was refrigerated. By far the biggest ferry on the Isle of Man routes, the Manx Viking weighs 3,589.43 tonnes and can carry a maximum of 777 passengers and 180 cars or 30 commercial vehicles. She has one of the greatest operating ranges of any UK ferry currently in service, and her 450 tonne fuel capacity would be sufficient to take her from Heysham to Port Stanley in the Falkland Islands without refuelling. 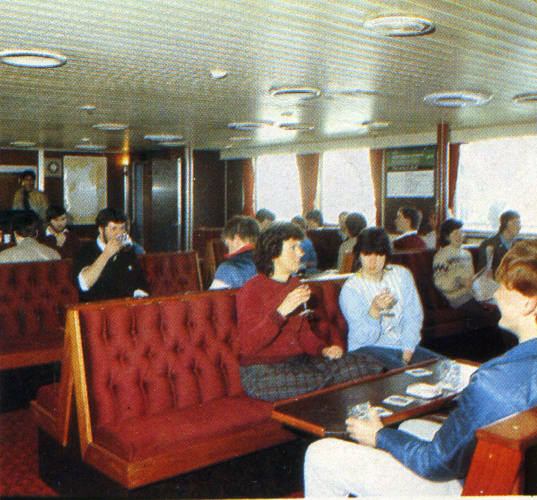 Now on to the many and varied passenger amenities on board, starting with the bar, which has been completely refurbished for 1984. Where better to spend four hours at the start of a holiday than in the Kippers� Bar which provides comfortable seating for ninety people, and a range of ales, wines and spirits to suit every taste. 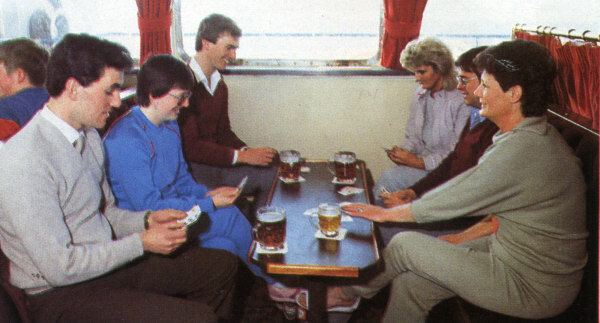 There�s Manx bitter as well as Tetley�s, and a choice of lagers on tap, together with a comprehensive selection of canned beers, minerals, wines, spirits and aperitifs. 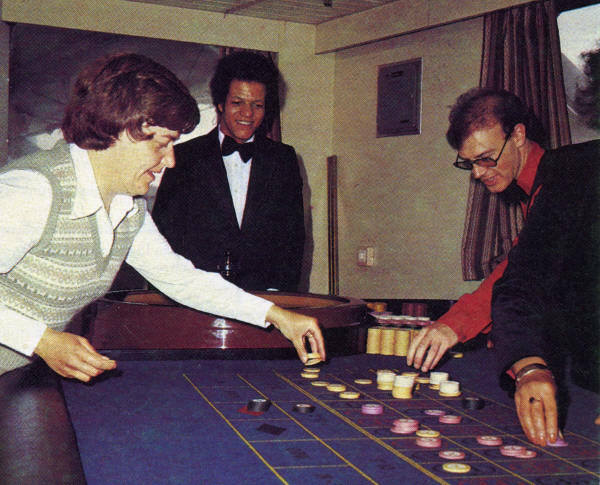 For further entertainment, there�s a juke box, one-armed bandits with cash prizes of up to �100, and for the recklessly inclined a game of chance at the pontoon table. The cafeteria is situated amidships on the passenger deck and offers a wide range of reasonably priced hot and cold meals as well as snacks, beverages, wines and beers. 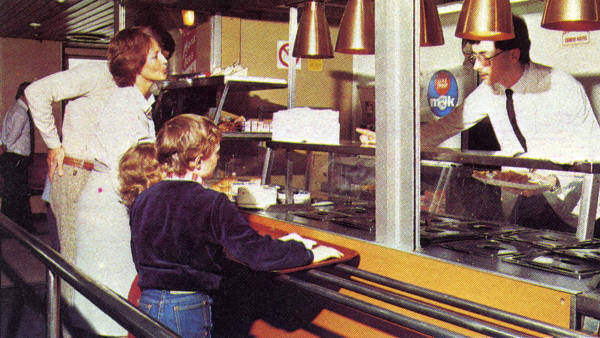 The cafeteria, which seats one hundred people, is self-service and is open for most of the voyage. There are also vending machines, from which hot and cold drinks, cigarettes, snacks and confectionary can be obtained. 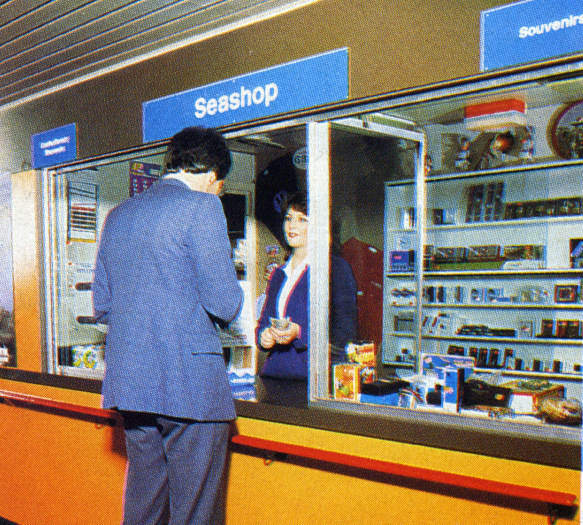 Passengers wishing to stock up on cigars, cigarettes, confectionary, toiletries, newspapers or magazines should head straight for the Sealink Sea Shop, forward of the cafeteria in the main foyer. Also on sale here is a wide range of Sealink and Isle of Man souvenirs. Look out for Sealink shop sales, where a bargain or two can be picked up. 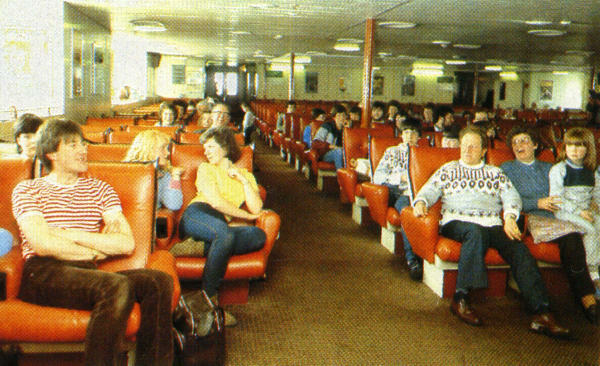 The Manx Viking has two main lounges, both of which offer luxury aircraft style seating, in forward facing rows. Again, every taste is provided for, with the aft or video lounge providing the main onboard entertainment with a varied selection of feature films, and the forward or quiet lounge offering the contrast of a peaceful crossing in quiet surroundings. The video lounge has five separate monitors, which are also capable of screening conventional television programmes. Video films shown last year included �Time Bandits�, �Kramer versus Kramer�, �Death on the Nile� and �Absence of Malice�. This year promises an equally impressive line-up with details of the programme displayed in the main foyer. There is no charge for admission to the video lounge. The forward lounge, like the video lounge, has a seating capacity of just under 300 and once again all the seats are in forward-facing rows. It�s ideal for reading or snatching forty winks in a silent, relaxed atmosphere. Half of the forward lounge has been designated the Manx Viking�s no smoking area, while smokers are welcome in the remaining 150 seats. Purpose built luggage racks in the form of window ledges run along the port and starboard sides of the passenger deck, aft of the gun-port doors. 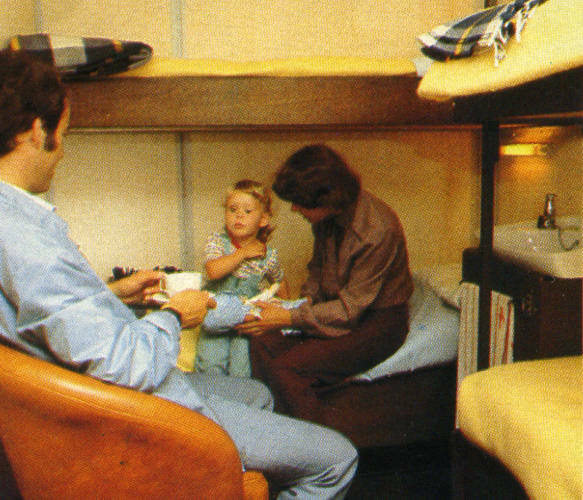 A new development for 1984 will be the introduction of limited cabin accommodation at the aft end of the aft lounge. The Purser�s Bureau is positioned on the starboard side of the ship alongside the catering office and close to the Sea Shop. There is a facility on the Manx Viking to make telephone calls, either local or long-distance, and a list of charges is available from the Purser. The crew�s quarters are located on the main boat deck (same level as the Kippers� Bar) where there is also extensive seating available for use in fine weather. There is cabin accommodation for three officers and 37 crew on the boat deck, and space for an additional nine officers on the bridge deck above. Above: Sealink profile deckplan of the Manx Viking. Above & below: Kippers' Bar. 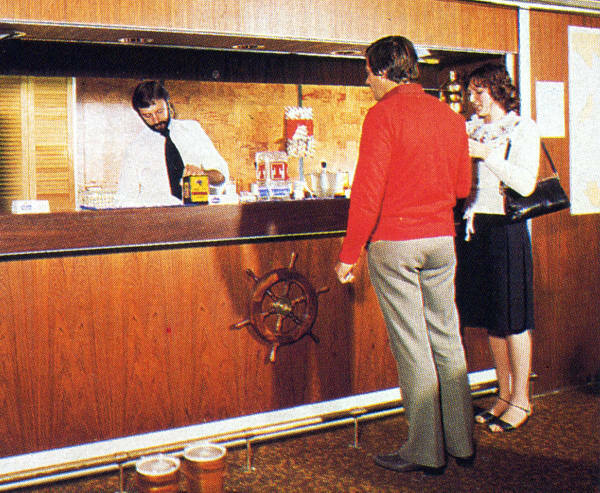 Above: The bar counter at the forward end of Kipper's Bar. Above: A small corner was set aside for gaming facilities. Above: The servery area for the cafeteria on the ship's main passenger deck. 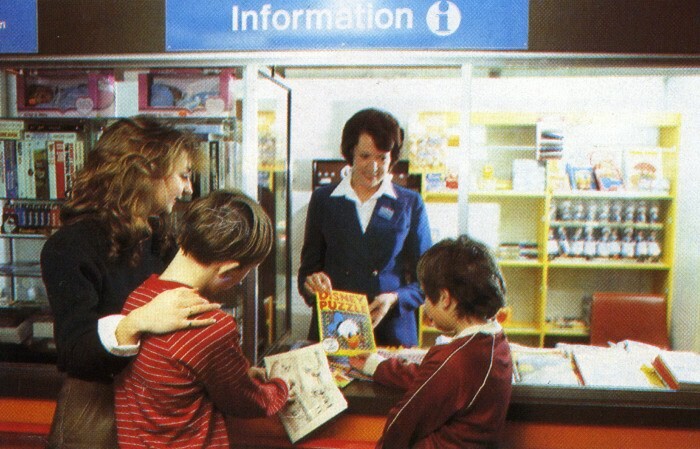 Above & below: The Seashop (above) in the main lobby, adjacent to the information desk (below). Above & below: Two views of the video lounge. Above: One of the Manx Viking's compact passenger cabins. 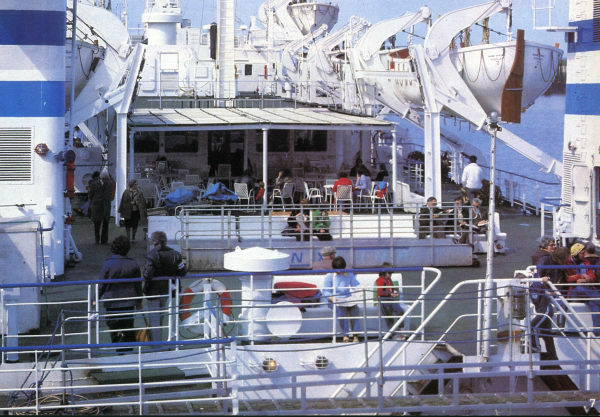 Above & below: The ship's outside deck latterly featured standard Sealink issue fibreglass seating (below). 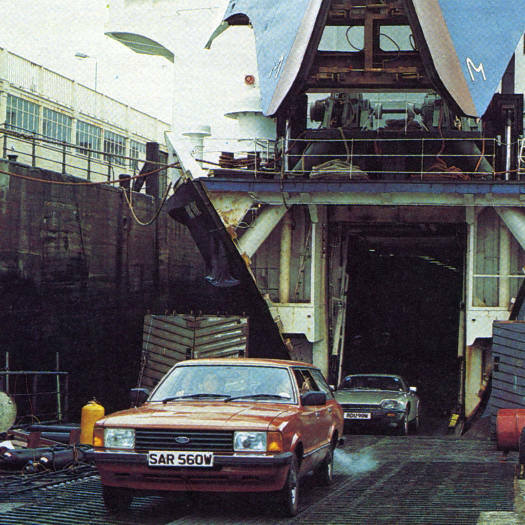 Above & below: The vehicle deck which brought ro-ro to the Isle of Man for the first time. 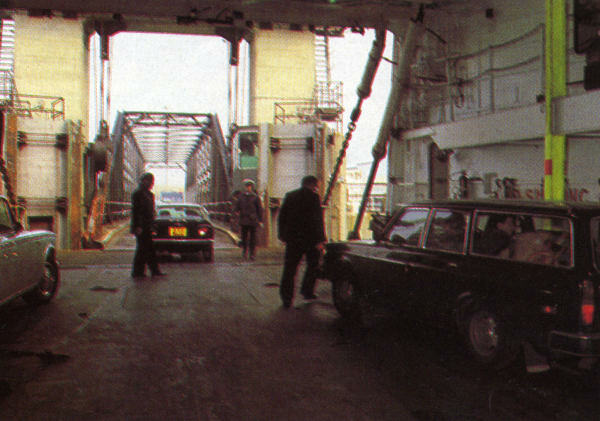 Above: Bow access was via a large bow visor and the ship is seen here unloading at Douglas in Sealink livery. Above: The Manx Viking in her Isle of Man heyday.